After much anticipation, Improper City opened its doors this fall and let us tell you, it does not disappoint. Similar to the Rayback Collective in Boulder, which shares common ownership, Improper City features a beer garden, food truck park, and event space. However it carries its own curated vibe specific to the RINO district. It claims to have the largest patio in Denver, CO and we don’t doubt it to be true. At 12,000 square feet, their patio holds enough space for six food trucks, a mobile bar, outdoor seating, firepits, and of course your favorite yard games. 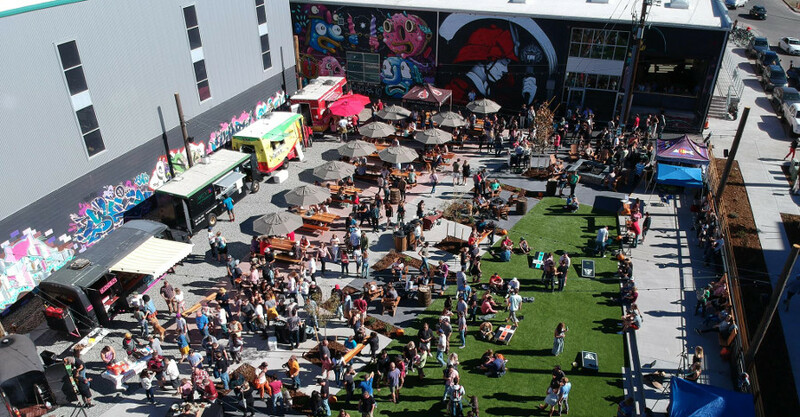 This is the extraordinary food truck park we’ve all been waiting for. With their grand opening just this October, It’s already one of our go-to spots. They list a changing lineup of 26 craft beers, 4 wines, and 8 draft cocktails. The bar is said to be 75 feet long and, for Denver’s 300 days of sunshine, there’s an outdoor mobile bar to help handle the crowds. Their monthly calendar includes events such as Holiday Market, Yoga + Yappy Hour, Artist Showcases, and more. We mentioned this place screams RINO, right? When you walk through the doors, the walls are lined with unique pieces from local artists, leading you up to the espresso bar where you can have your sustainably sourced coffee beans any which way you please. Depending on the day, you may be entranced by live music from local bands or soloists. The ambience welcomes everyone, whether you’re looking for a community workplace or a friendly happy hour. Did we mention this place fits perfectly into our beloved RINO district? So far we’ve seen some great food trucks on the opening lineup, including La Rola Urban Columbian, Beef King, Goin’ South, Crescent City, Basic Kneads, and La Rue, just to name a few highlights. You can expect that sunny days will bring a rotating list of four to six trucks to choose from, keeping even your pickiest of friends happy. Of course you can check out Truckster to preview which trucks will be there, and if you’re like some of our friends, already have your order picked out before you even leave home! What’s Next for Improper City? Okay so it already has everything! What to look out for coming next? It’s rumored that Improper City will be working with CRUSH, Denver’s annual street art festival, likely for more fascinating outdoor murals to decorate Walnut Street. We imagine this place will take on it’s own unique character as it matures, just as Finn’s Manor and other RINO favorites have done. The real question is, for those of us who work there from time to time, at what point in the day do we switch from delicious coffee beverages to Ratio Beerkworks’ seasonal on tap? Conclusion: If you haven’t been to Improper City yet, YOU MUST GO! No matter your tastes or preferences, this place is life changing. It will become your new staple. With so many food trucks and beverages to choose from, you will always need to come back to try something different.